Psst - are you a business owner or sales manager? Well, listen up, because QuoteValet Insight was built with you in mind, giving you a closer look at your quoting and sales processes! QuoteValet Insight™ is a browser-based solution that gives users insight into the progress of the company’s documents that have been uploaded to QuoteValet anytime, anywhere, streamlining communication and simplifying sales management by bringing both high-level and detailed data to you in a format that’s easy to view and collaborate on. You can log into QuoteValet from a PC, tablet, or phone anywhere an internet connection is available. QuoteValet Insight is mobile friendly, and its interface will adjust automatically based on your device’s screen size. With the ability to view this information anytime on any web device, you’ll have the answers you need at your fingertips in a snap. QuoteValet Insight streamlines communication and simplifies sales management by bringing both high-level and detailed data to you in a format that’s not only easy, but also – dare we say it? – FUN to read, use, and share. QuoteValet Insight is chock full of features that will give you a more robust, comprehensive look at your sales processes. 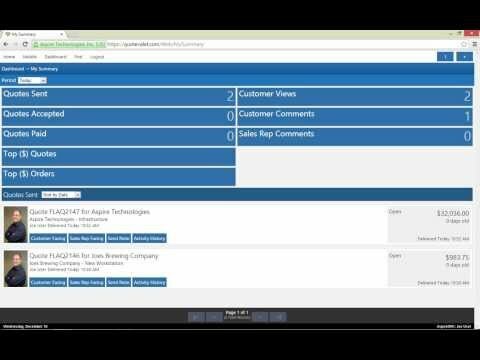 Here's just a taste of what you can expect: The Executive Dashboard gives you major visibility over quoting and sales processes across the board, from all sales reps. View top-dollar quotes and converted orders; number of quotes sent, accepted, and paid; sales-rep and customer comments; number of customer views on documents; and more. My Summary is similar to the Executive Summary, but shows only information relating to the currently logged-in user. The Find feature allows you to quickly locate and view any QuoteValet document by searching by its Document Number, Name, and/or Sold to Company name. The Inbox is equivalent to the QuoteValet inbox within QuoteWerks, but is now a mobile feature with QuoteValet Insight! Here, explore sales reps' quote information, such as dollar value and age, as well as activity: whether quotes have been viewed, accepted, paid, etc. You'll also see which documents have questions or comments posted on/about them. QuoteValet Insight is included in your QuoteValet subscription for no additional fee.